October 7, 10 am – noon — Coffee Hour — Join us for a cup of coffee or tea, a sweet or two and good conversation. Suitable for all ages! October 7, 7pm, International Observe the Moon Night — Peacham Library and Northeast Kingdom Astronomy Foundation invite you to join us for International Observe the Moon Night, a worldwide celebration of our nearest neighbor, the Moon! NOTE: Date and time may change depending on weather; please check www.nkaf.org or www.peachamlibrary.org and the library throughout the week to be sure you come on the right day! Held at the observatory. October 8, Herb Club – A special herb walk oat Sage Mountain will take place on Thursday, October 13 instead of the normal Herb Club meeting. 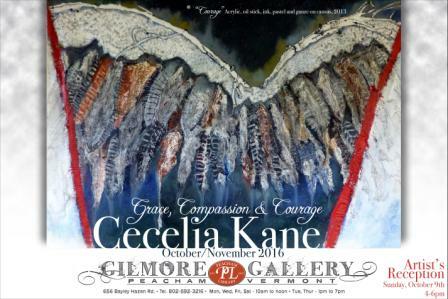 October 9, 4-6pm, Artist’s Reception – Grace, Compassion and Courage, paintings by Cecelia Kane. October 10, 4:30pm, Friends of Peacham Library – Join the Friends as they plan events and fundraising activities in support of the library. Thank you for all your help and support! October 10, 6:30 pm, Peacham Knitters and Puzzlers – Bring your knitting or other handwork for an evening of creativity and chatting. Or work on the current jigsaw puzzle. October 13th 10:30am-12pm — Herb Club — In place of our normal monthly herb club meeting, Melissa will be offering a free herb walk at Sage Mountain. Sage Mountain is Rosemary Gladstar’s 500 acre herbal retreat center. This gem is a piece of herbal history with multiple herbal display gardens and wild weeds. Numerous hiking trails are also open to the public during office hours so you are welcome to stay for a hike after the walk. The office will be open as well, featuring Rosemary Gladstar books for sale. Children are welcome. Please RSVP if you can to Melissa or the library, though all are welcome, including family and friends. October 14, 10 am – noon — Coffee Hour — Join us for a cup of coffee or tea, a sweet or two and good conversation. Suitable for all ages!